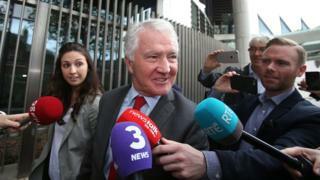 Irish banker Sean FitzPatrick has been formally acquitted of fraud charges after the longest criminal trial in the country's history. The former chairman of the defunct Anglo Irish Bank was told he was free to go after a 126-day at the Circuit Criminal Court in Dublin. He had faced 27 charges over misleading auditors about millions of euros of loans to him, which he denied. He returned to court on Wednesday for a final time to hear his acquittal. Mr FitzPatrick stepped down as chairman of Anglo Irish Bank in December 2008. A month later, the bank was nationalised after it was brought to the brink of collapse. The move cost Irish taxpayers about 30bn euros (£23.4bn). Sean FitzPatrick was the public face of the Anglo Irish Bank and his star rose with it. He became general manager in 1980 and was later appointed chief executive of the parent company and transformed it into Anglo. In 2005, he became the chairman, but he maintained a hands-on role - it was still very much 'Seanie's bank'. He became an admired and influential figure, at one stage acting as an unofficial advisor to Prime Minister Brian Cowen. But in 2008, he was forced to resign amid allegations about the true size of his personal borrowings from the bank. On Tuesday, the judge ordered the jurors to acquit the 68-year-old. The judge was critical of the investigation into Mr FitzPatrick's loans, which was carried out by the Office of the Director of Corporate Enforcement (ODCE). Investigators accepted the judge's declaration that it had not been sufficiently unbiased, impartial and balanced. Witnesses were coached when giving statements during the investigation and that their evidence was contaminated. Speaking in court on Wednesday, the judge told Mr FitzPatrick: "The prosecution having confirmed that there is nothing else against you, you are free to go." Mr Fitzpatrick, who was joined in court by his daughter Sarah, said: "Thank you."